I am an eye cream floozy, I'll try one and move straight on to the next - nothing ever wows me. 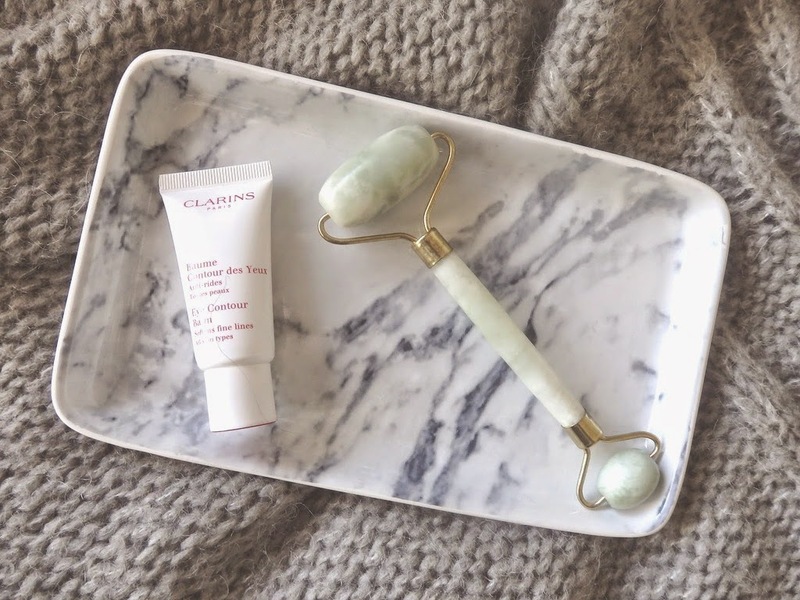 Currently I am using the Clarins Eye Contour Balm, it's good that's all for now I can say, however when a good eye cream meets a good tool; good turns great. This jade roller along with my eye cream is seriously helping my puffy 'it's too early eyes'. I apply the eye cream lightly with my finger then use the smaller roller back and forth - it feels so so good. I also do this in the evening as it's a relaxing step especially if it has been a long day, a hungover day or you have that annoying change of seasons cold which I am currently suffering with. There are several eye creams that come with a metal device that are rather expensive including the infamous la mer so this concept I am trying isn't exactly ground breaking but I am noticing a difference in the puffiness for sure, also I do actually like that this is separate for hygiene purposes obviously it is only going on my eyes but the eye area is one you want to be particularly meticulous with. I just wash this is an antibacterial hand soap every week or so. These jade rollers are available everywhere by various brands that can make them rather pricey I got mine from eBay here, an extra step, that for me makes a difference so let's stop expecting eye creams to do it all in their own and give them a helping hand.